In first-summer many show pure grey saddle against strongly bleached upperwing with almost whitish midwing-panel. Bill and legs sometimes grow yellower; bill-tip becomes pale from late winter, giving space for the black bill-ring. Common Gull normally has a complete black bill-tip in first-summer. Eye pale from one year of age. ID pitfalls for first-years are small second-year Herring and American Herring with bill pattern similar to Ring-billed. In the large species, look for a grey mantle combined with much darker mottling or bars on coverts, broad white and irregular tertial-tips and more solid brown areas on the underwing-coverts. 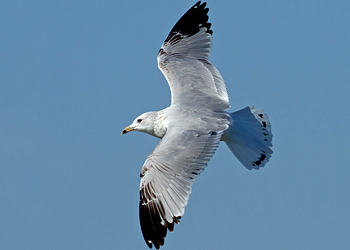 A combination of first-year-like wing pattern and pale eyes is frequent in Herring (in Ring-billed, first-year wing is always combined with dark eyes). Herring and American Herring are larger with a more sloping forehead, heavier bills (tips especially ‘masculine’ and bulbous-shaped), smaller eyes, longer legs and shorter wings with broader white primary edges and less wing projection beyond tail than in Ring-billed. 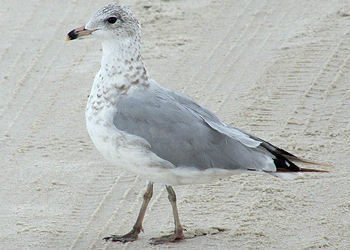 Inner primaries often plain grey in second-year Herring Gull; in first-year Ring-billed there are dark spots near the tips of the inner primaries. If present, red traces on gonys confirm Herring. Ring-billed Gull delawarensis 1st cycle, April 18 2010, Boston, MA. Picture: David Sibley. Ring-billed Gull delawarensis 1st cycle, April 18 2010, Boston, MA. Picture: David Sibley. Ring-billed Gull delawarensis 1st PB moult, July 17 2008, Daytona Beach, FL. (Tore Grebberg). Ring-billed Gull delawarensis 1st PB moult, July 17 2008, Daytona Beach, FL. (Tore Grebberg). Ring-billed Gull delawarensis 2nd cycle, October 27 2010, Dallas, TX. (Wikipedia Commons). Ring-billed Gull delawarensis 2nd cycle, January 03 2012, Seward Park, Seattle (Amar Ayyash). Ring-billed Gull delawarensis 2nd cycle, March 01 2013, Canaveral National Seashore, FL. (Tammy Karr). Ring-billed Gull delawarensis 2nd cycle, March 01 2013, Canaveral National Seashore, FL. (Tammy Karr). 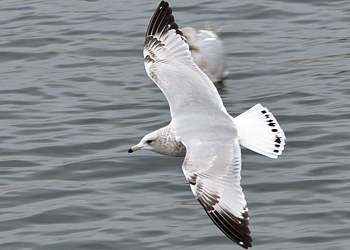 Second-winter similar to adult, but with darker outer wing, as primary coverts and alula are dark (pale grey in adult) and the white on the wing-tip is smaller, usually restricted to a small white mirror on P10 (second-year Common Gull has a larger mirror on P10 and often a small one on P9). 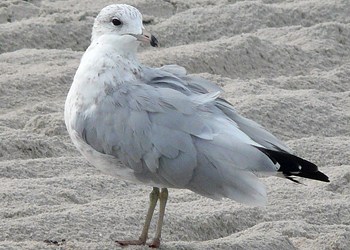 Settled birds have a darker wing-tip, lacking the white tips of adults. Traces of a dark tail-bar are the rule; many also show scattered dark on secondaries, dark lesser covert bar and dark tips to some underwing-coverts. 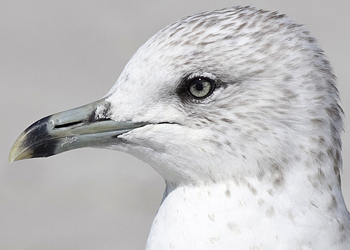 Such immature characters are much rarer in Common Gull nominate canus, but more frequent in eastern taxa and Mew Gull. Bill often three-toned with grey-green or fleshy base, black ring and paler tip. Some develop the adult bill. Eyes usually pale, but some have eyes predominantly dark until second spring. Legs greyish (not bright yellow as in adult). 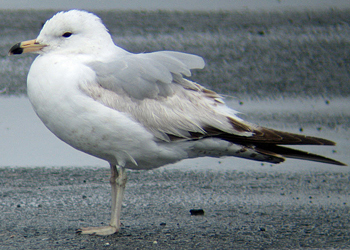 Second-summer as second-winter before moult into adult plumage, but head white and bill as adult. 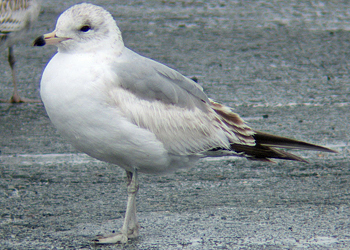 Third-winter/ summer as adult, but white mirror on P10 smaller and outer primary coverts with narrow dark markings. Ring-billed Gull delawarensis 1st cycle (2CY), March 01 2013, Canaveral National Seashore, FL. Picture: Tammy Karr. 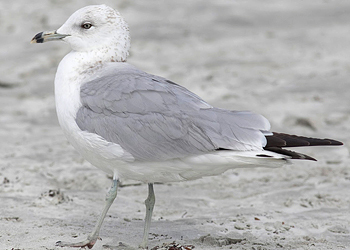 Ring-billed Gull delawarensis 1st cycle (2CY), March 18 2013, Miami beach, FL. Picture: Antonio Silveira. Ring-billed Gull delawarensis 1st cycle (2CY), March 10 2014, Tinley Park, IL. Picture: Amar Ayyash. Ring-billed Gull delawarensis 1st cycle (2CY), March 09 2014, Chicago, IL. Picture: Amar Ayyash. Ring-billed Gull delawarensis 1st cycle (2CY), March 27 2008, Nags Head, North Carolina. Picture: Becky Gregory. Ring-billed Gull delawarensis 1st cycle (2CY), March 19 2012, Las Vegas, NV. Picture: Mike Levine.